The major difference between cane sugar and high-fructose corn syrup is that the first is commonly used in the form of table sugar, while the other is primarily available to food producers. Otherwise, the differences between the two are subtle; both have the potential to harm your health. The sugar cane plant produces a tall stalk that stores sugar in the form of sucrose. When it's harvested, the stalk is pressed to extract the sugary juice, then it's boiled until crystals of sugar form. These raw sugar crystals contain impurities, so they're sent to a refinery where they're washed, filtered, recrystallized, dried and packaged. The resulting sucrose is sold as granulated sugar. Sucrose, or table sugar, consists of equal parts of two types of sugar – glucose and fructose. Sweet corn is full of sugar in the form of carbohydrates. The corn's starch is extracted and processed to produce corn syrup, which is 93 to 96 percent glucose. Corn syrup is further processed into high-fructose corn syrup by using enzymes that convert glucose into fructose. High-fructose corn syrup can contain as much as 90 percent fructose, but the syrups used commercially are 42 percent or 55 percent fructose, which makes them chemically similar to cane sugar, according to an article in the December 2008 issue of the "American Journal of Clinical Nutrition." 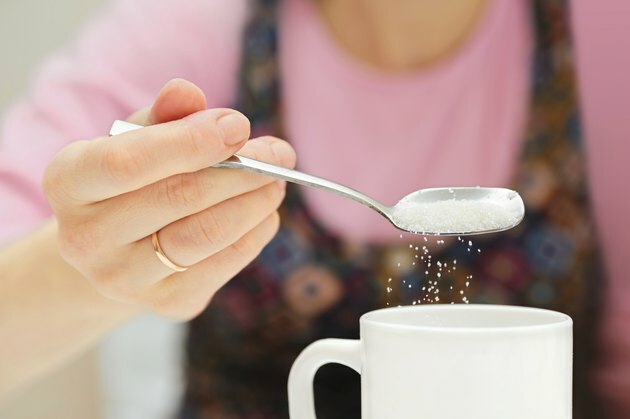 While the sweeteners themselves are not very different, the individual sugars they contain behave differently in your body Glucose raises blood sugar, stimulates the release of insulin and is metabolized in cells throughout your body. Fructose doesn't directly boost blood sugar because it's only metabolized in your liver, where it's converted into fat. As a result, it can boost your blood lipid levels -- consuming more than 100 grams of fructose daily may increase the levels of triglyceride in your bloodstream, according to an article in the April 2011 issue of "Circulation." Since cane sugar and high-fructose corn syrup have about the same proportion of glucose and fructose, the American Heart Association does not acknowledge one as more damaging to your health than the other. Cane sugar and high-fructose corn syrup both have 4 calories per gram and, as sweeteners that are added to foods, they contribute pure calories without any nutrients. High-fructose corn syrup is a bigger health concern only because it's added to so many foods and beverages, sometimes in large amounts. For example, a 12-ounce cola has 22.5 grams of fructose. Overconsumption of added sugar can cause weight gain, which subsequently increases your risk of heart disease. The American Heart Association recommends that women consume no more than 6 teaspoons of added sugar each day, while men should limit their intake to no more than 9 teaspoons daily.